from 3 pcs. 3,54 EUR ea. from 10 pcs. 3,07 EUR ea. from 20 pcs. 2,84 EUR ea. from 40 pcs. 2,64 EUR ea. 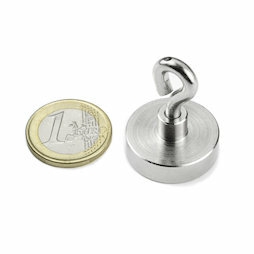 The eyelet on this pot magnet ensures a very secure fastening. We also carry this magnet in white. You can unscrew the eyelet from the pot.